Ice skating is an exhilarating but physically challenging sport in which ankle pain and injuries can occur. The Ice Skating Institute notes that the design of your lower leg makes ankles uniquely vulnerable to injury and stress; in addition, ice skating requires sudden starts and stops, which can place strain on your feet, arches and ankles. Proper equipment, treatments and exercises can help alleviate pain and reduce the risk of injury. Two major muscles, the peroneal and the tibialis anterior, take the brunt of the stress from ice skating; it is these that are most likely to become painful and inflamed. The peroneal muscle -- which contracts when you pick up your feet -- causes pain on the outside of the ankle. Podiatry Today notes that long hours on the ice can actually weaken the peroneal muscle, making off-ice sprains more likely. The tibialis anterior muscle runs down the outside of the shin. Prolonged skating causes this muscle to shorten. After a skating session, the now-shortened muscle exerts pressure on the tendon, causing pain at the front of your ankle, below your shinbone, and sometimes in your arches and along the outside of your foot. 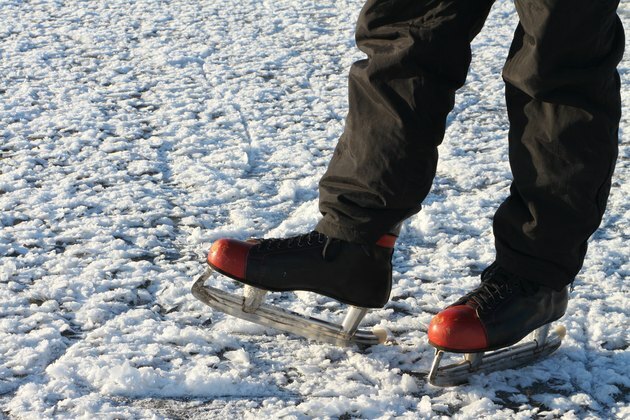 According to the Ice Skating Institute, you can use a dowel -- a thin, round length of wood 24 inches long and 1 and 1/2 inches thick -- to work out painful muscle spasms in your ankles, increase circulation and help stretch contracted muscle fibers. Sit on the floor with your leg bent and the affected ankle turned inward, then place the dowel gently below the outside of your knee and slide it down the outside of your lower leg, stopping before the ankle. Muscle spasms -- or knots in the muscle -- are indicated by especially painful areas; press the dowel against them for 30 to 60 seconds before proceeding down the leg. By turning your foot outwards and placing the dowel along the outside of your shinbone -- avoiding the bone itself -- you can treat the tibialis anterior muscle as well. To avoid a bone bruise, never push the dowel onto a bone. Pain in your ankle following a fall may indicate a strain or a sprain. Strains involve the stretching or tearing of ankle muscles or tendons; with a sprain, it is the ligaments connecting the ankle bones that are stretched or torn. You may feel a "pop" in the joint as the sprain occurs. Symptoms of both strains and sprains include pain, swelling, and a limited ability to move the affected joint or muscle. You can treat sprains and strains using the R.I.C.E. technique. Rest from the activity that caused the injury, apply ice for 20 minutes every few hours, wrap the ankle in a compression bandage, and keep it elevated above heart level, if possible. If you can't walk more than a few steps, can't move your ankle, experience numbness or notice reddened skin -- or if symptoms don't improve despite self-care -- consult your doctor. Many ankle injuries and pain can be prevented or alleviated by wearing correctly fitted skates with the proper degree of flexibility. The boot must be stiff enough to provide support, but not so stiff that it prevents proper flexion. Podiatry Today, noting that most skaters' boots are too stiff, recommends that the uppers should bend slightly to average force applied with the hands. Since skate boots are notoriously lacking in arch support, an orthotic may be helpful. You can also pad areas that put pressure on bony ankle prominences; good choices include moleskin, felt and silicone. Finally, your coach may recommend off-ice stretching and strengthening exercises to promote balance, power and proper movement.